LONDON, UK, 2018-Jul-25 — /Travel PR News/ — Hidden away in the heart of Soho at No.61 Rupert Street is Spuntino, a restaurant that consists of 27 stools and a popcorn machine. The New York comfort-food inspired eatery has developed a cult following with London foodies and is soon to be opening its doors at Heathrow Terminal 3. 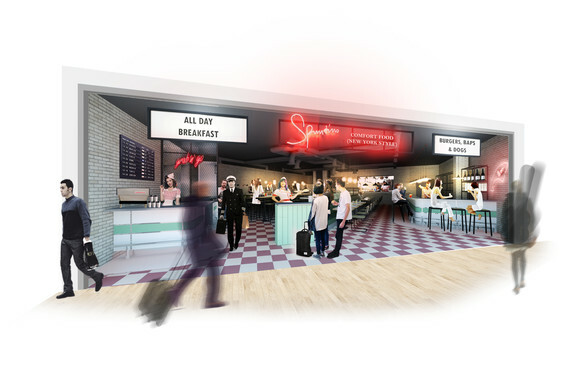 Spuntino, which means ‘snack’ in Italian, will develop a bespoke airport breakfast and takeaway menu to deliver an ‘all day dining’ and ‘on board’ experience for many of the 18 million passengers who travel through Terminal 3 each year. The new menu will follow the same ‘small plates’ theme as its existing site. Spuntino is the brainchild of restauranteurs Richard Beatty and Russell Norman, the pair behind Polpo, who earlier this year signed an exclusive franchise partnership with TRG Concessions and have wasted no time in finding a location for their first project together, due to open in December 2018. The restaurant will be serving up an authentic menu consisting of classic Spuntino staples alongside newly developed breakfast, children’s and takeaway menus. Key features of the new location will include a doughnut machine, roller skating host and a newly commissioned mural painted by famed Soho artist Neal Fox. Nick Ayerst, Managing Director of TRG Concessions, said: “After years of talks with Richard and Russell, we are delighted to now be working on our first collaboration with them and Heathrow. Spuntino in Terminal 3 will offer passengers an exciting new eating and drinking experience. Ben Crowley, Head of Food and Beverage, Heathrow Airport said: “Spuntino is a fantastic new addition to Heathrow’s dining offer. We know our passengers want delicious, quality food that they can enjoy together or take away with them for an in-flight treat. Spuntino has all this and a unique dining experience, bringing the excitement of Soho to our international customers and leaving them with a lasting taste of London before they fly. This entry was posted in Airports, Food & Drinks, Travel, Travelers and tagged Ben Crowley, dining, Heathrow, Nick Ayerst, Scott Macdonald, Spuntino, ‘Food. Bookmark the permalink.